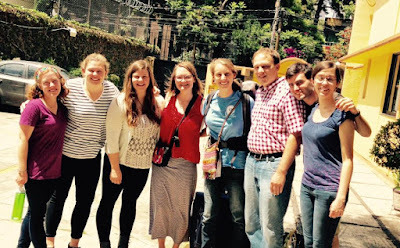 I can hardly believe that I am writing this update almost a month into my time in Mexico! This month has felt like one of the most condensed months I have ever experienced, and sometimes I feel as though I am on the steepest learning curve of my entire life. I could write pages about everything I have experienced so far, but for brevity´s sake, I will provide a more general update on my life so far in Mexico City. 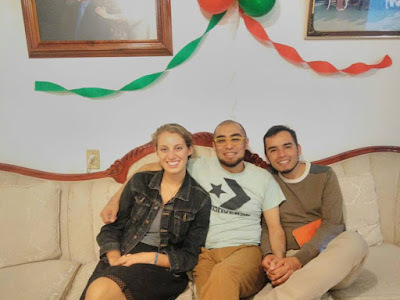 As some of you may have read in my first blog post, I will be serving this year with el Centro de Estudios Ecumenicos (CEE), which is an ecumenical group in the center of CDMX that combines faith, activism, and social justice in a variety of areas, including arms trade reform, community feminism, environmental stewardship, and land rights protections. It is a relatively small staff that manages to juggle numerous projects, and that travels throughout several states in Mexico to work with their accompanying communities. I specifically work on the land rights team, through two main projects: el Consejo Tiyat Tlali and la Escuela de Formacion Integral. El Consejo Tiyat Tlali works with several predominately rural communities in the state of Puebla who are being threatened by mega projects in the area, including mining, fracking, and hydro-electric dams. These mega-projects have serious environmental impacts in these communities, often resulting in polluted resources, health concerns, and depressed economies. La Escuela de Formacion Integral (EFI) is an educational platform that invites local communities and churches in the costal region of the state of Oaxaca to view environmental issues through a spiritual/ecumenical/faith-based lens and respond to environmental threats in their communities. Within these projects, I primarily work in the communications department, maintaining blogs, compiling news sources, creating materials to send to supporters, and maintaining social media platforms. I will also have the opportunity to create other communication tools (videos, interviews, blog posts, etc...) to reflect what CEE is doing. I am starting to familiarize myself with video/photo editing tools, as well as some basic blog/web design, which is exciting, but easier said than done when all the software is set in Spanish. Day by day, I´m settling more into my role, and am excited to continue learning and developing new skills. I am beyond fortunate to be living with mis papas mexicanos, Nef and Dani. Nef and Dani are a young, newly-wed couple who are long-time residents of the city. Nef works as a dentist, and is also studying full-time to be a nurse, while Dani works at a pawn shop. They are both extremely involved in our church, Buen Pastor, which is a bilingual church with an extremely diverse congregation hailing from multiple countries. Both Nef and Dani love music, movies, art, museums, discussing theology, and learning new languages (and they are very good at the latter). Although we all have extremely different work schedules, we still find time to go to church together, be out and about in the city, or even just relax at home and shoot the breeze. They are extremely kind, nurturing, and welcoming people, who tolerate my broken, heavily-accented Spanish with the patience of saints. So far, we have been able to go to museums, meet members of my extended host family, attend performances, and explore the city together. As someone who enjoys staying busy and being out and about, I am extremely happy to be living with people who are always up to try something new. Nef and Dani have immediately welcomed me into their family as their own, and have redefined radical hospitality for me. I had heard from past volunteers that Mexico City was enorme-however, I had no idea how big it was until I arrived. The city is a swarming, huge, overwhelming place, with all extremes of life in one place. The public transportation system is best described as organized chaos, and is an adventure within itself-with a rough population of 20 million, over 4 million people ride the metro every day. (For comparison´s sake, Charlotte, NC is the biggest city between D.C. and Atlanta and has a population of 0.8 million). During the rush hours, all of those 4 million passengers seem to be crowded into the same car, as I and thousands of other people leave work from the city center and head home. In addition to the metro system, there is also the metrobus, microbuses, which are similar to 15-passenger vans, and combis, which are similar to mini-vans. Anyone who knows me knows that I do not possess great directional prowess. However, between maps, my host dads, and the kindness of strangers, I have yet to get *completely* lost. Despite it´s overwhelming size, I am becoming more and more enamored with CDMX. There are numerous world class museums, tons of live music and performances, parks, theaters, markets, and a world-class emerging culinary scene. The city is the cultural, economic, and political center of Mexico, and always has something new to offer. It is a place where you can encounter the ruins of the Aztec capital, the murals of Diego Rivera, and the oldest and largest cathedral in Latin America, all within the same square. For these reasons, and many more, Mexico City was voted the #1 travel destination for 2016 by the New York Times. Overall, I am happy to say that I am safe, healthy, happy, and well-cared for amidst all the hustle and bustle of a thrumming metropolis. It is a humbling experience to be the person who looks different, who can't speak the local language correctly, and who has a thick accent that can be difficult for other people to understand. I stick out like a tall, blonde, white sore thumb, whether I'm towering over the people in the metro, or making laughably bad grammatical errors. However, I believe the person who learns to laugh at his/herself will never ceased to be amused, and although each day brings it's own challenges and it's own slice of humble pie, I try to take it all in stride. I am constantly blown away by the kindness and warmth I receive from people, whether it's a stranger on the microbus assuring me that yes, I am getting off at the right stop, my host grandmother gifting me her shirt after me mentioning that I liked it once, or my co-workers asking if my family is ok during all the chaos in Charlotte. I often feel extremely underserving, and find myself wishing I could give something in return, despite the linguistic/cultural barriers. However, I am reminded that this year is less about giving than learning to receive, less about doing and more about being present, and less about having all the answers and a "plan" and more about embracing all the wild, beautiful unknowns. Thank you for all your messages, love, and support. Thanks to the generosity of my family, friends, home congregation, and many other donors, I am fully funded (! ), but if you are interested in contributing to the growth and availability of the YAGM program for future volunteers, please feel free to donate on my personal page at http://support.elca.org/goto/MadisonBurke. As always, please feel free to contact me via Facebook or email, and please keep my hometown, Charlotte, NC, in your prayers. YAGM-Mexico fam, on our last day of orientation, as we headed off to our sites. Mis papas mexicanos-Dani (center), and Nef (right). "Enrique's Journey", Sonia Nazario. Written by Pulitzer-prize winning journalist, this book describes the harrowing journey of a young boy as he journey atop the train system known as La Bestia from Central America to the US in search of his mother. "The Devil's Highway" , Luis Alberto Urrea. In May of 2001, 26 men entered the a section of southern Arizona known as "the Devil's Highway". Only 12 survived. A must-read for anyone who wants to learn more about the border. Economix, Michael Goodwin. I had never formally studied economics, but this excellent graphic novel made even the most difficult economic concepts understandable. "Nickel and Dimed", Barbara Ehrenreich. In the late '90's, the author spent several months working minimum-wage jobs to see if it was possible to survive or thrive with at such low wages.